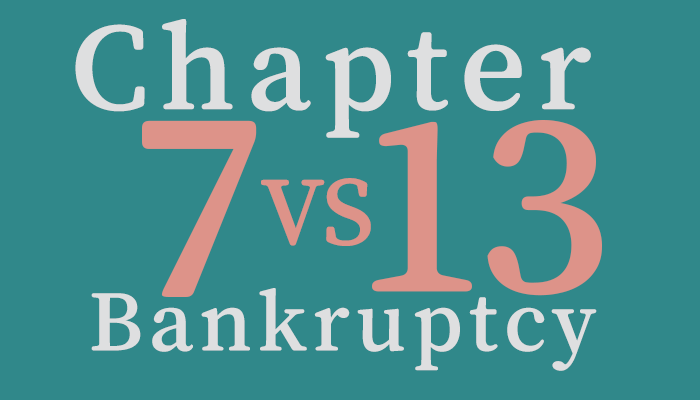 Chapter 7 vs 13 Bankruptcy: What's the Difference? Chapter 7 vs 13 Bankruptcy: What’s the Difference? Bankruptcy can be a way for individuals and businesses to hit “refresh” on their financial life, moving into the future with the debt relief that they not only need, but genuinely deserve. If you’ve been considering filing for bankruptcy, it’s important to understand and weigh all of your options, before committing to a plan. Broadly speaking, there are two types of bankruptcy that most consumers should be aware of – Chapter 7, and Chapter 13. These are the two most common forms of bankruptcy; of the millions of consumer bankruptcy petitions filed between 2005 and 2017, about 68% were filed under Chapter 7, and 32% under Chapter 13. It’s important to understand these two types of bankruptcy – how they each function, how they differ, and what they can and cannot accomplish for you. Chapter 7 bankruptcy is also commonly referred to as “liquidation” bankruptcy, and is the most common type of bankruptcy among individuals. Chapter 7 bankruptcy will allow a consumer to discharge much of their unsecured debt – that is, credit based purely on a promise to pay it back, usually with interest. This often includes credit cards, medical bills, some retail store loans, payday loans, and so on. In Chapter 7, consumers are generally able to liquidate their debts, without having to pay back balances using a repayment plan (as in Chapter 13). In Chapter 7, an automatic stay order generally serves to stop creditors from attempting collection; at the same time, a bankruptcy trustee is named to oversee the case. The bankruptcy trustee is generally responsible for taking on different tasks during the process, including selling nonexempt property to pay back creditors. The trustee will oversee the surrender and liquidation of non-exempt assets, the money from which is split among creditors according to priority. In certain cases, Chapter 7 debtors may be able to retain most, if not all, of their personal property, including their home and vehicle (provided that certain qualifications are met). Certain debts – including taxes, student loans, and child support – cannot be discharged in bankruptcy. Generally, most Chapter 7 bankruptcy cases take several months to complete, with a record of bankruptcy remaining on the filer’s credit record for up to ten years from the date of filing. In order to qualify for Chapter 7, an individual must pass a means test, or demonstrate that their income is lower than the state median. Before filing, individuals must also obtain mandatory credit counseling, as well as a financial management course later on. This is to help ensure that individuals understand the bankruptcy process they will be going through, and help set up their finances on a more sound footing moving forward. Chapter 13 is also thought of as “reorganization” bankruptcy. It is also sometimes called “wage earner’s” bankruptcy, because Chapter 13 is, broadly speaking, intended for debtors with a regular income, who are able to pay back at least some of their debts in line with a structured repayment plan. The terms of this plan, including the amount paid back to creditors, will vary, depending on the person’s income, expenses, type of debt, and so on. In Chapter 13, consumers use a repayment plan to pay back creditors, either in part or in full. Generally, Chapter 13 bankruptcy takes place over a time frame of several years (though this is dependent on the debtor’s income). When this plan is successfully executed and the court issues a discharge order, most remaining unsecured debts can be discharged, ending a debtor’s liability to their creditors. As in Chapter 7, there are certain exceptions (such as student loans and support obligations) that cannot be discharged. With Chapter 13, filers get to retain all of their property, including non-exempt assets (in turn, creditors must generally be paid an amount equal to the value of their non-exempt property). Chapter 13 also offers filers the ability to catch up on past mortgage payments, and strip certain liens from their property. The bankruptcy may remain on a consumer’s credit report for up to ten years from filing, though some creditors only report Chapter 13 for seven years. Broadly speaking, Chapter 13 may be a viable option for those who need debt relief, but who do not qualify for Chapter 7. There is not an income requirement, but a person’s secured and unsecured debts must fall below a certain limit in order to qualify. As in Chapter 7, non-corporate debtors are required to take credit counseling course through an approved agency, as well as a financial management course after filing. .
Hopefully, those explanations prove helpful. But it’s important to remember that we’ve only looked at the broad strokes here. In reality, everyone’s situation will be different – and it may prove essential to consult with a professional in order to determine what will truly be the best course of action for you. There are any number of factors that need to be considered, from Illinois median incomes to allowable expenses, to the amount of secured vs. unsecured debts, the mathematical formulas used for means testing, and so much more. It’s a lot to tackle alone. If you have any questions or are looking for guidance, the Gunderson Law Firm can help can get you actual, straightforward answers for your unique situation – no need to search for all the variables and hope you don’t miss any key detail. At the Gunderson Law Firm, our experienced bankruptcy team will take all steps possible to protect you and your assets immediately, and throughout the bankruptcy process. Down the line, we can also counsel you on realistic ways to avoid such serious debt issues in the future. Whether you are a business owner, a wage earner, retired, or otherwise, we can address your specific situation with strategic plans to help put severe indebtedness behind you so you can enjoy life again. Don’t hesitate to drop us a line with any questions, or to set up your free initial consultation.